I didn’t know “protein pancakes” existed until last year. If you haven’t tried them, you’re missing out. 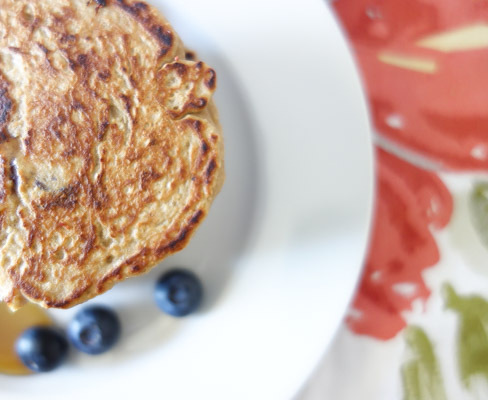 Protein pancakes are an easy and healthy way to get additional protein and recover after a hard workout. The best part about these? Since they’re healthy, I don’t feel bad eating one of these for dinner one night after a good workout. An excuse to have pancakes for dinner? I’m in. You can easily make whatever variation you want. You can substitute raspberries or other fruit for the blueberries, add dark chocolate chips with the fruit or even just use dark chocolate chips depending on how you feel. You could choose to buy oatmeal flour, but if you have a food processor, Vitamix or other similar kitchen gadget, you can grind the oatmeal yourself to create the oatmeal flour. It is cheap and really easy. I usually keep some oatmeal flour on hand. You can use it for other healthier recipes (and not so healthy recipes like oatmeal cookies). Mash the banana in a small bowl and stir in the oatmeal flour and protein powder. I used a plant-based protein powder. Stir in the egg and milk. You can opt to just use egg whites instead of a full egg, but you may need to add some additional milk. Add in the spices, vanilla, and additional milk as needed. It should be a fairly smooth consistency, but not runny. With the oatmeal flour and protein powder, it will not be as smooth as your typical pancake batter. Gently stir in the blueberries. Spray a skillet with nonstick cooking spray and pour in half of the batter. Like with regular pancake batter, the pancake is ready to flip when it begins to bubble. Carefully flip the pancake and cook for an additional couple of minutes until the bottom is golden brown. Repeat with the remainder of the pancake batter. Serve the pancakes with fresh blueberries and real maple syrup. Grind rolled oats in food processor until consistency of a powder to create the oatmeal flour, approximately 5 minutes. Mix protein powder and oatmeal flour with banana. Stir in egg and milk. Add spices and additional milk as needed to achieve proper consistency. Coat skillet with non-stick cooking spray (regular or coconut oil spray will work). Pour in half of pancake batter to form one large pancake. Flip pancake with bubbles begin to form. Repeat with second half of batter to make second pancake.